The Historic Jackson Ward Association (HJWA) represents the residents located in the blocks North of Broad, East of Belvedere, South of I-95, and West of 4th Street in the City of Richmond. The Association was established in the 1980’s and has been very active building relationships among community members and improving the quality of life for all its residents. For the last six years, the members of HJWA have taken it upon themselves to clean the neighborhood of litter, debris and graffiti – resulting in great community pride. This Community Revitalization began with three cleanups each year. Now, because so many of our neighbors do their own cleanups throughout the year, we scaled our organized community cleanups to two times a year – one in the spring and one in the fall. With this Grant we focused on expanding our initiative to include plantings for natural beautification and a lot of weed removal. KVB funding has been used to enhance our open spaces with native ground cover plants and small shrubs. In particular, funding was used for plants, mulch and a variety of garden tools and gloves, as well as trash grabbers and bags. 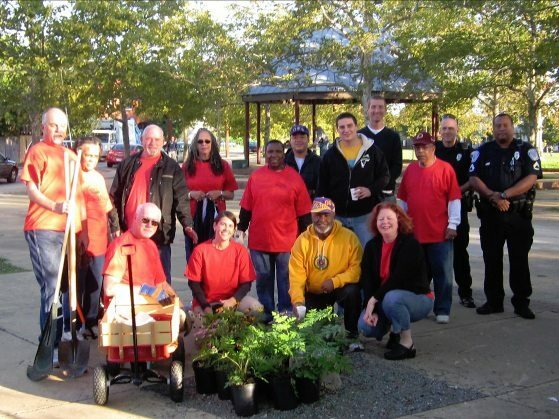 In addition to the plantings, many of the volunteers improved the aesthetic value of the neighborhood by removing trash and debris from streets, sidewalks, and alleys. We are proud of our neighborhood and we want all of those who pass through to know that Jackson Ward truly is a beautiful place to live! Weight of trash collected— 1,800 pounds! Volunteers hauled various types of material to the city’s trash truck, including several couches, mattresses and televisions as well as woody and plant debris and portions of a fence. Also collected were 19 bags of trash filled with food wrappers, fast food containers, clothing, bottles and cans . Approximately twenty tires were recovered and sent to a proper disposal facility. The tonnage for the day’s collected materials was estimated at 1,800 pounds. Numbers of Volunteers— 20 neighbors and VCU students, two police officers, and two public works employees (with their truck!). Area and number of Plants Planted— 675 square feet of land adjacent to the neighborhood playground at Abner Clay Park were revitalized with forty native plants (including black eyed susans, aster, coreopsis, phlox, and ferns). In addition, monkeygrass was planted to fill in gaps that help improve aesthetics and control soil loss. After planting, 24 cubic feet of mulch was spread over the area to help retain moisture and enhance the site.